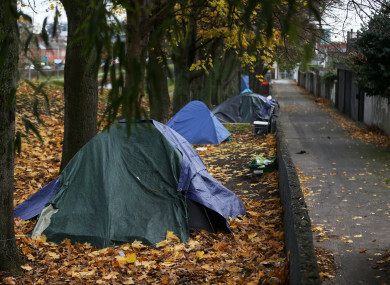 File photo of tents along the Royal Canal. THE NUMBER OF homeless people living in emergency accommodation in Ireland rose by almost 200 people last month. Emergency accommodation figures for May show that there are now collectively 9,846 homeless people living in homeless shelters or hotels across Ireland. There was also an increase of 12 families and 137 children in May. The number of homeless children in Ireland is now 3,826. In Dublin – where the issue is by far at its worst – the number of homeless families dropped by 14, but the number of children rose by 76. No families were removed from the figures over the so-called “categorisation issue”, which has resulted in to date about 900 adults and children being removed from the monthly count. Housing Minister Eoghan Murphy has said that the families in these situations were in “homes”. This is despite criticism levelled at the Department by opposition TDs as well as charity officials over the removal of families from the monthly figures. Dublin City Council assistant chief executive Brendan Kenny has also said that these families were “still homeless”, despite being removed from the figures. Commenting on the figures, Minister Murphy said that any increase in people in emergency accommodation is “very disappointing”, but said that the figures pointed to a continuation of the “stabilisation” that had been seen in recent months. “Family homelessness has always been more of a pronounced problem in Dublin than in the rest of the country, so it is encouraging that the numbers of families accessing emergency accommodation in May fell,” he said. The Minister referenced two recently published homeless reports and said that he would be bringing forward policy responses based on them “as a matter of priority”. He also said he would be holding a Housing Summit next week, on 3 July, with the heads of chief executives of each local authority where they would discuss how to tackle the issue. The latest figures are being discussed in the Dáil currently. Fianna Fáil’s children spokesperson Anne Rabbitte said that the number of homeless children in Ireland was “wrong”. “I never play politics on it minister, I don’t criticise but it is wrong. It is wrong and I’m not saying it solely lies at your door,” she said. Sinn Féin housing spokesperson Eoin Ó Broin said that he was “ashamed to be a member of the Dáil”, as it was “presiding over the single biggest rise in child homelessness on record”. Labour housing spokesperson Jan O’Sullivan called the numbers “truly shocking”. Email “'Truly shocking': There are now 9,846 homeless people in Ireland”. Feedback on “'Truly shocking': There are now 9,846 homeless people in Ireland”.